In a setting that looks more like a large, hip coffee shop than anything else, stands a stage with state of the art musical instruments – everything from an electric stand-up bass to a near four-foot-tall African drum. And then there’s the music, that, if you’re not careful, could just knock you right over. Their music is different in more than the sense that it’s not the type typically played in the outback of Ottertail. It’s a form of worship; an expression of their love for the Lord. With titles like "Rise Up," "Butterfly," and "Spread Your Wings," their worship music takes the listener on a spiritual experience not commonly explored through traditional church groups. Their sound appeals to those of all ages, and despite their desolate location in a town of 451, has reached thousands throughout the globe who share a common love for Jesus. The group’s artistic form of expression certainly isn’t limited to music. Ministry members exhibit various modes of creativity to express their love. Interpretive dance is commonly used during worship, as well as painting and poetry. Peter and Pam Thiel, pastors and co-founders of the nondenominational church, Firestarters, returned to central Minnesota in 1996, after working as associate pastors for six years in Alaska. They returned to Ottertail with a mission to create a ministry that enabled young people to grow closer to God, and take part in what they call "A Love Revolution." With their four children, the Thiels are doing just that. Firestarters now has two large buildings in Ottertail, which tend to stick out considering they’re a bit out-of-the-ordinary for the area. Both structures have been built from burned down buildings, modified to reflect the ministry’s artistic attitude. The most recent project, which is still on-going, is the re-construction of the old creamery building in Ottertail. 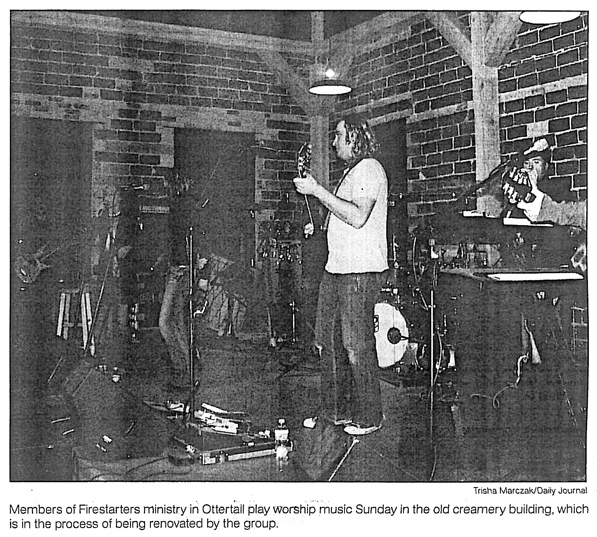 Previously used as a tire store, the building was subject to a fire, which meant that when the Firestarters crew took over, there was a great deal of work to be done. But with their abilities and faith, the project continues to move forward. Now, Firestarters is able to hold their Sunday meetings in the upstairs of the building, where the roof, walls and staircase have been completed. The other building, which also serves as the Thiel’s home, strikes curiosity among many locals and passer-bys. Formerly a bed and breakfast, that building, too, had been subject to fire. Now it’s a modern structure which has, for years, served as a meeting place for worship. It also includes a state-of-the-art recording studio and dance studio. Despite all the intriguing aspects of their material designs, Firestarters is more than just a group of talented musicians who live and play in a neat, renovated structures – they’re a group of people connected through God, taking a stand for God, and encouraging others to hop on board.